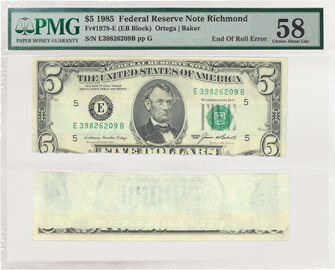 This Series 1985 $5 Federal Reserve Note is an error note printed by the US Bureau of Engraving and Printing. The note features a portrait of Abraham Lincoln that was taken by Anthony Berger at Matthew Brady’s Washington gallery on February 9, 1864. The image of Lincoln used on the new, redesigned $5 note was also taken on that same day. The vignette on the reverse of the note depicts the Lincoln Memorial. The note is signed by Treasurer of the United States Katherine Davalos Ortega, and Secretary of the Treasury James Baker, III. 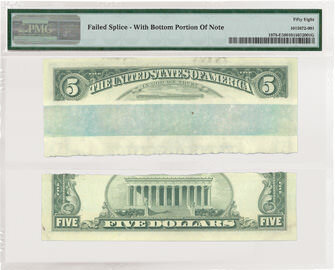 This note has been certified with an end of roll error and failed splice. A splice is the joining together of two items — pieces of paper or film for example. This note must have been printed where two ends of rolls of paper were improperly spliced together and eventually separated. 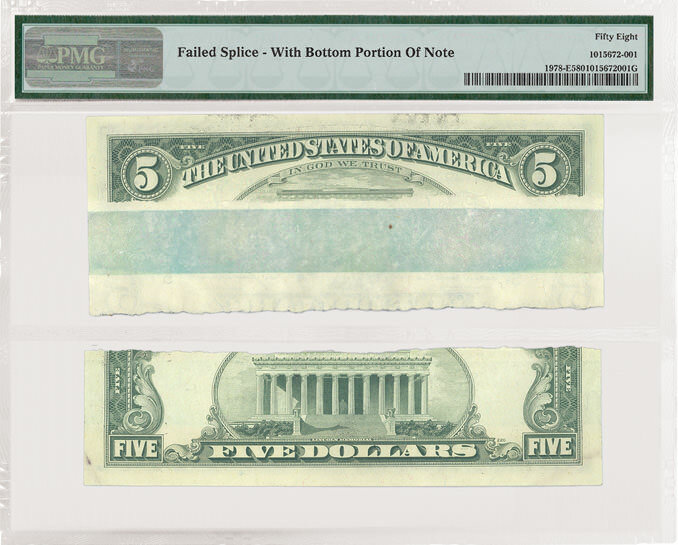 According to the BEP website, they receive the paper for producing notes in cut sheets (two pallets of 10,000 sheets at a time) so the splice must have occurred during the production of the currency paper. The owner of this note was lucky enough to retain both pieces and sent the entire note in for grading.